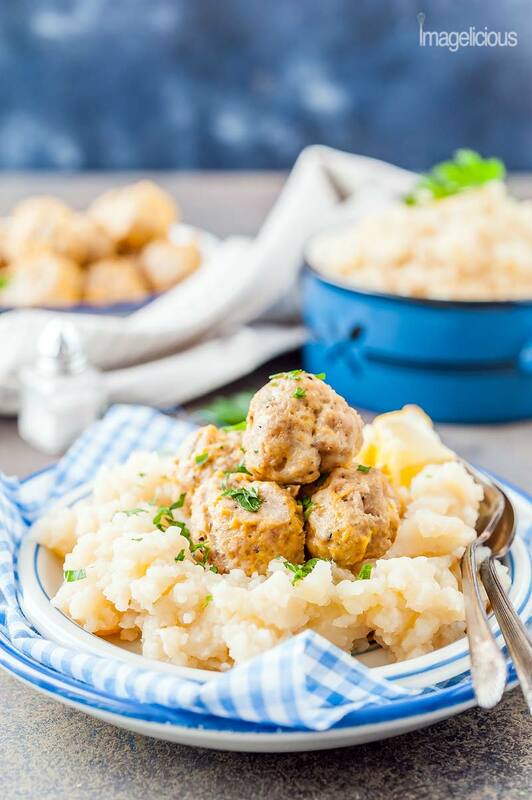 These Instant Pot Meatballs and Mashed Potatoes are an easy and delicious comforting meal, ideal for a weeknight dinner. Meatballs are healthy and not fried. The whole dish comes together easy in a pressure cooker and you don’t have to watch multiple pots and pans to cook a complete meal. it’s a true one-pot meal. This post contains amazon affiliate links which means that if you purchase an item after following one of those links, I will receive a small commission. I took a little break from blogging. 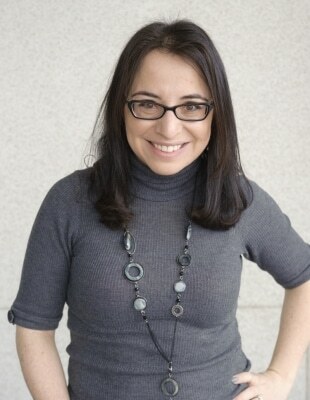 I wish it was a break to relax and recharge, but life happened and I just physically had no time and, on occasion, no energy to sit down in front of my computer and write a post. Life is funny. Sometimes there are days, weeks even, when everything is the same and slow and comforting and hours drag like thick molasses. And then suddenly there are swirls of activities, events, deadlines that hit you over the head and rush over thick and steaming like boiling and foaming milk. You blink and a month has gone. The day I posted my last recipe my cat died. I know for many people it means nothing. For me, for my family, it was (and still is) a big loss. It wasn’t sudden. She was old and sick and we’ve been spending thousands and thousands of dollars trying to get her to be better. In the end, I was relieved she wasn’t suffering anymore. I still miss her. I still look for her every time I come home. I spent a week after sitting with my other cat, making sure he did not feel alone. Making sure I did not feel alone. Just as I started to breathe a little, I got an insane deadline to proof read and edit my manuscript. I received a big stack of papers in the mail and spent a week reading over and over and over again and making marks and edits on the paper. By the end of that exercise I felt cross eyed. 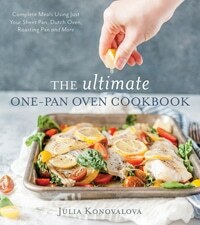 But my cookbook, Ultimate One-Pan Oven Cookbook (already available for purchase) looks awesome. Or at least the pdf the publisher sent me. It was incredible seeing all my hard work come together. And I can’t wait to hold the physical book in my hands. And, of course, just as I finished editing my cookbook, my daughter decided to switch from two naps a day to one. And I have to say – It’s a complete disaster!!! I have no idea how I am going to be able to do anything anymore, let alone keep posting recipes. Also, showers are way overrated. Well, now that my pathetic excuses are out of the way, I want to concentrate on this really convenient electric pressure cooker one-pot meal. I made this recipe at least half a dozen times already and I have to restrain myself from making it every week. The combination of meatballs and mashed potatoes is comforting and cozy. It’s a perfect one-pot meal for a weeknight dinner, just add some vegetables or a salad as a side dish. Making meatballs in the Instant Pot (or another electric pressure cooker) means that you get deliciously juicy and moist meatballs. They won’t taste like your regular pan-fried meatballs. The texture will be closer to steamed. They cook on a trivet just above the potatoes, so all the juices trickle down and mix with the mash. There is a lot of talk about using milk in Instant Pot and most experts discourage that. Milk separates at high pressure and high heat into protein and whey. Basically, it curdles. It sounds weird but it actually is not bad at all. I love adding ricotta or cream cheese to my mashed potatoes and this is pretty much what happens here: curdled milk is almost ricotta. Trust me, there will be no strange texture or flavour in these Instant Pot Mashed Potatoes! 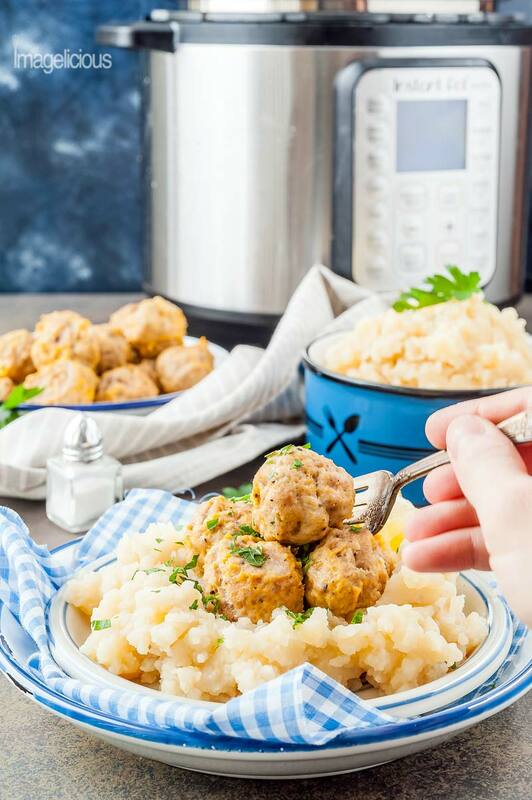 Together, these Instant Pot Meatballs and Mashed Potatoes are full of flavour. They are easy to make and relatively healthy since there’s no oil involved in making the meatballs. I don’t buy a lot of organic meats but this particular recipe tastes better with organic ground chicken. If you are looking for some delicious meatballs that aren’t steamed, try my Dill Meatballs and Lentil-Turkey Meatballs, they are made in the oven and are totally delicious and healthy. How do you make these Instant Pot Meatballs and Mashed Potatoes? It’s super easy and everything is made together in one pot, making it a true one-pot meal. I like my mashed potatoes smooth so I always peel them but it’s an optional step. Once the potatoes are prepped and chopped, they are added to the pressure cooker along with some milk, a tiny bit of butter (also optional), and chicken or vegetable broth. A trivet is placed over the potatoes and the meatballs are placed directly onto it. I use ground chicken, my favourite Mrs Dash spice mix, salt and pepper, egg, and a bit of breadcrumbs. Then it all cooks for 20 minutes in the Instant Pot. Once the meatballs and instant pot potatoes are cooked and the pressure is released, just take the meatballs out of the electric pressure cooker and mash the potatoes. You could add a bit more milk if you like your mashed potatoes to be lighter and thinner. I like mine thicker so I don’t use any extra. It’s a great and easy meal that comes together quickly and doesn’t require multiple pots and pans. How long do these Instant Pot Meatballs and Potatoes actually take to cook? My Instant Pot consistently takes 15-16 minutes to come to pressure for this particular recipe. Pressure cooking on high is another 20 minutes. Releasing the pressure for this recipe takes between 2 to 4 minutes. The difference is in the amount of potatoes. If I use just a couple of ounces more than I specify in the recipe, then more liquid is absorbed into the potatoes and the pressure releases faster. If I use an ounce or two less then there’s more liquid and the pressure releases slower… At least this is my non-scientific theory. 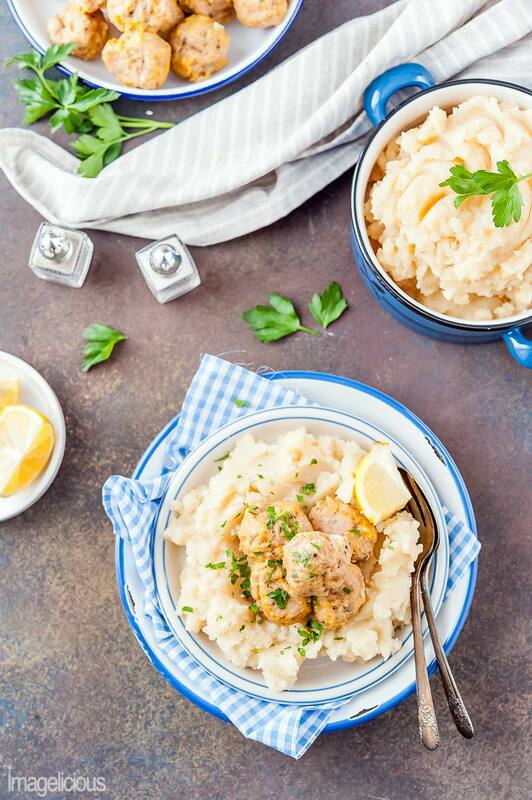 Total time in the pressure cooker: it takes just under 40 minutes to cook these Instant Pot Meatballs and Mashed Potatoes. But don’t forget to factor in about 10-15 minutes to prep and cut the potatoes and make the meatballs and then another couple of minutes to mash the potatoes. Total time for prep and cook: just under an hour, making this dish an ideal weeknight dinner for the night when you don’t have to rush around the kitchen. 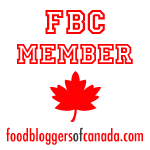 Why make Meatballs and Mashed Potatoes in an electric pressure cooker? The great thing about cooking both the meatballs and the potatoes together in a pressure cooker is that even though the meal takes an hour from start to finish, you are only actively doing something for just about 15 minutes. You don’t have to make sure that the water for the potatoes is not over boiling. You don’t have to keep an eye on the meatballs and turn them around. You just prep everything and forget about it. Perfect and easy meal! I use whatever broth I have on hand. I usually use Better Than Bouillon. You cannot use all milk though. If you don’t want to use broth, you can use water but it will be less flavourful. All milk will burn. You can use 2% or 3% milk. I am not sure if you can use skim milk or cream. My guess is yes but I haven’t tried myself. You can omit the milk and use all broth instead but the mashed potatoes will not be as creamy. You can add extra milk once potatoes are mashed if you like thinner mashed potatoes. I strongly prefer organic ground chicken for this recipe. For some reason there’s really a big flavour and texture difference! I have not tried this recipe with ground turkey but I think it should work fine. Mrs Dash original, no salt spice mix is one of my favourite secret ingredients. It has a wonderful savoury combination of spices. If you don’t have that spice mix on hand (and you should) then just use your favourite spices that you like to use for your meatballs. I like adding breadcrumbs to meatballs and meatloaves but adding them creates a firmer texture. If you prefer less firm meatballs then you can omit breadcrumbs or use less. Check out my video to see how easy (and delicious) these Instant Pot Meatballs and Mashed Potatoes are to make! 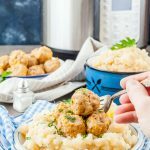 These Instant Pot Meatballs and Mashed Potatoes are an easy and delicious comforting meal, ideal for a weeknight dinner. Meatballs are healthy and not fried. The whole dish comes together easy in a pressure cooker and you don't have to watch multiple pots and pans to cook a complete meal. Peel and chop the potatoes into 1 inch pieces. Add the potatoes to the Instant Pot in one layer. Cube the butter and scatter on top of the potatoes. Add the vegetable or chicken broth, milk, and place a trivet that came with the Instant Pot on top of the potatoes. In a large bowl, thoroughly combine all the ingredients for the meatballs together until the mixture is smooth. Roll 20 meatballs about the size of a walnut in a shell each. Place all the meatballs on the trivet on top of the potatoes. Close the lid of the Instant Pot and make sure to move the valve to Sealing position. Press Manual or Pressure Cooker button (depending on your model) and use the arrows to select 20 minutes. It will take about 15-16 minutes for the Instant Pot to come to pressure, depending on how cold the stock is. Once the 20 minutes of pressure cooking are up and your Instant Pot beeps that it's done do a manual quick release. I like putting a small kitchen towel on the pressure release valve to contain the steam a little bit. It takes between 2 to 4 minutes to fully release the pressure. Open the lid, carefully remove the trivet with the meatballs. You might need to use silicone mitts to do so. Mash the potatoes right in the pot. Add more milk if desired. This isn’t quite enough meat for my 18-yo athletic son and my 2 elementary girls and myself. Each time I’ve made it, I put the meatballs on a single layer on the trivet. If I double the amount of meat, and have to stack the meatballs – will they cook well enough, where they touch each other in the stack? Any idea? I have not made the recipe yet, though I will. What kind of Potatoes do you use? Can I use Yukon Gold and does that change the time? I would love to add a gravy base to this – similar to a Swedish meatball. Any suggestions? Also what’s hard is one nap compared to two, I can totally relate! Sometimes I want to let the baby nap one more time, around 5 pm, just to get that 40 min break and breath! But then I know the bedtime will be so late I will regret it. It was nice during vacation, as we got to check out the night activities. But at home it’s completely different. Mama needs to have stuff done! And last, but not least – these meatballs and mash look soooooo heavenly good! My type of meal for sure!